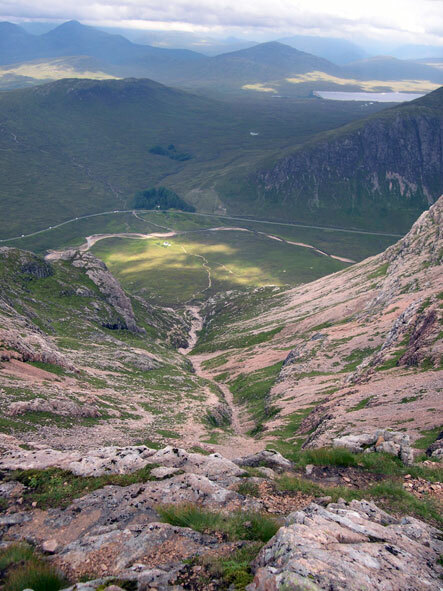 This is a somewhat unusual approach to Buachaille Etive Mor, tackling the mountain from behind, starting just east of Dalness and the Lairig Gartain path. 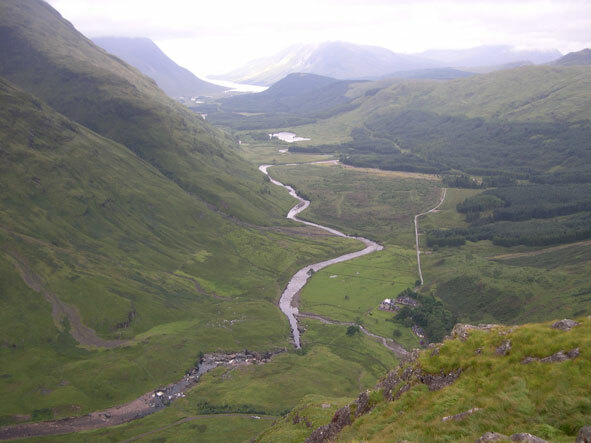 The downside of starting in Glen Etive, is that you will be welcomed by hordes of midges and their ferocious bite. So be prepared and bring suitable repellant. Although not obvious at first there is a clear approach line to the right of the ridge following a wide gully on the south side. This is a steep ascent at first, through long grass and ferns making the ground slippery in places. It was so wet my trousers we soaked all the way to the thighs by the time I reached the ridge, making me wish I had put my overtrousers on at the bottom. Higher up, the gully is less steep and the going is easier on short grass. Once on the ridge it is an easy route across grassy slopes north west towards the foot of the first Munro summit of Stob na Broige. There is an extensive boulder field below the summit, but you can pick your way through this following an obvious path and grassy strips. Up to this point, we had been teased with occasional tantalising views of Loch Etive behind us as the cloud temporarily lifted, but on the summit the cloud was stubbornly refusing to move. A lengthy stop on the summit as we celebrated a Munro “compleation” with plenty of champagne to cheer us in the cold murk. Then all of sudden, after a few false starts, the cloud lifted to reveal a panorama stretching from Loch Linnhe, up through Glen Coe and across to Rannoch Moor and beyond. There before us lay the spine of Buachaille Etive Mor with a clear ridge path snaking along its length. This made for quick easy walking up and over the two Munro tops, Stob Coire Altrium and Stob na Doire. 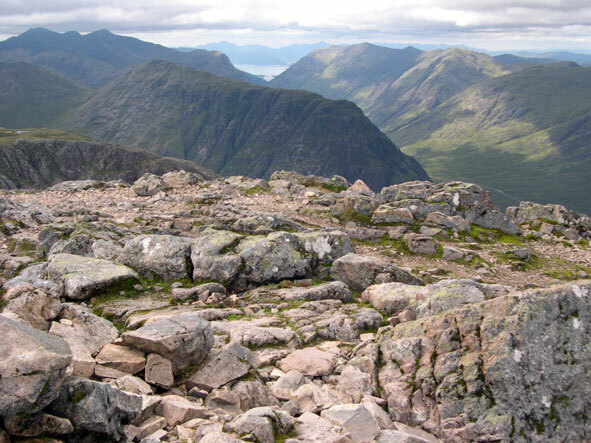 It is a pity that Stob na Doire is not accorded the status of a Munro itself, it is a fine summit and more impressive than the less significant Stob na Broige. At this stage our plan to descend via a coire to the Glen Etive road changed and the whole group decided to carry on to Stob Dearg and then down in to Altnafeadh, where one of our party had parked, allowing the other drivers to be ferried back to their cars. I am glad we carried on, as I would have been disappointed not to climb Stob Dearg having got so close. In many ways it is a disappointing peak, from the ridge it is an unimpressive lump of red scree and rocks, unglamorous compared to its iconic profile seen from the A82. Being such an easily accessible mountain the route to the top was clear and well trodden; the reward being extensive views all around. You are sat in the middle of some of the best mountains the Highlands have to offer, dizzying number of peaks stretching before you as you tick them off on a mental map. Back down to the col and the start of the path descending into Coire na Tulaich, it is down loose scree at first but soon becomes clearer and firmer. Later on the path is down large rock steps much of the way, after a long day you feel every one of these steps down. As you descend you follow the burn on your right hand side eventually crossing it at the coire floor and the fairly level path pass the climbers hut and onto the car parking spaces at Altnafeadh.